Capsule Summary: The doctors swap ghost stories while dealing with a Halloween deluge, Hawkeye tries to help a soldier traumatized by the death of his friends, and a dead soldier turns out to be not-so-dead. I swear the timing of this spotlight is entirely coincidental. I use a random number generator to pick which episode to review and “Trick or Treatment” just happened to be picked for today. Eerie coincidence, right? 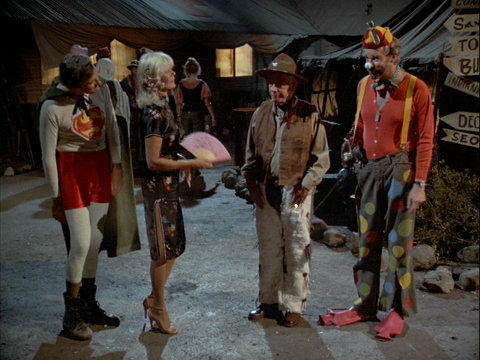 This was the only Halloween episode of M*A*S*H and it’s not the strongest episode. At times it feels very disjointed. It features a mix of comedic and serious storylines. In total, there are four storylines: ghost stories in the O.R., drunk marines, Private Scala, and the dead soldier who returns from the dead. I’ll start with the scary stories. They’re shared throughout the episode. Colonel Potter tells everyone about a dream Mildred had in 1939 in which her brother Calvin sat down on her bed and tipped his head at her. The next morning, they learned Calvin had died. Mildred’s sister had the exact same dream. Hawkeye recalls how his uncle was once led back to sea by an old fishing boat called The Luck of the Irish. His uncle later discovers The Luck of the Irish sunk twenty years earlier. Margaret’s story involves someone taking a picture of a car wreck that, once developed, revealed a picture of a man killed in the wreck wearing the suit he was buried in. I wonder if a story was written for B.J. and either not filmed or cut from the episode for time. Private La Roche (played by George Wendt of Cheers fame) and the pool ball stuck in his mouth. Charles has a lot of fun with him. Corporal Hrabosky (played by the controversial Andrew Dice Clay, who was credited as simply Andrew Clay) and the chickens. Colonel Potter later encounters an MP looking for Hrabosky. Private Crotty and his injured hand, which he stuck into a moving fan on a dare. Charles also treated him. Unlike La Roche and Crotty, who Charles later confronts in Post Op, we never see Hrabosky again. Private Scala’s storyline is depressing. The poor guy is starving himself because his buddies were all killed while he was standing in line for seconds. He only survived because he was a pig and can’t even look at food now. Hawkeye suggests Scala talk with Sidney Freedman but Scala doesn’t think anyone will be able to help him forget what happened. Hawkeye says he has to learn to live with it. There’s no resolution to this storyline, either, which only makes it more depressing. Finally, there’s the dead soldier who isn’t dead. He arrives with wounded soldiers and is left in the compound until Graves Registration can come get him. Hawkeye later asks someone to cover him up with a sheet. Nobody notices is hand move. He’s alive. It’s only when Father Mulcahy starts administrating the Last Rites that he realizes the unnamed soldier isn’t dead. “This is definitely one ghost story nobody is going to top,” Hawkeye declares. Unfortunately, Charles wasn’t around to offer his thoughts. He’d probably blame everyone for not checking the man’s vitals and assuming he was dead because he had a toe tag on. In the tag scene, B.J. and Hawkeye get their revenge on Charles, who laughed at all the scary stories, by tying a rope to the side of the Swamp to trick Charles into thinking there was some sort of ghost or poltergeist at work. Superman, a Geisha, a Cowboy, and a Clown standing around. “Trick or Treatment” was the first of 10 episodes produced for Season 11. When Hawkeye, B.J., Margaret, and Colonel Potter gather in front of the Swamp to show off their costumes, several other characters can be seen in the background also wearing costumes. There’s a ghost, a sailor, a clown, and several other unidentifiable costumes. This is the last of seven episodes to guest star James Lough. He played a different character in each episode. In “Trick or Treatment” he played Private Crotty. Richard Lineback, who played Private Scala in this episode, previously played Eddie in “Dear Uncle Abdul” during Season 8. John Otrin, the ambulance attendant, later played an ambulance driver in “Goodbye, Farewell and Amen.” And Herman Poppe, who played the M.P. who argued with Colonel Potter about chickens, later made a guest appearance on Trapper John, M.D. in 1983. The storyline involving Private Scala I think was foreshadowing events in ” Goodbye, Farewell and Amen.” I’ve read in several different interviews with Alan Alda that the episodes of the final season were written to lead into the finale. Private Scala doesn’t believe Sidney can make him forget and Hawkeye responds with something to the effect about you never forget what happened. You just learn to live with it which is ironic in light of what happens to Hawkeye later. That’s just one humble MASH fan’s opinion. Radar mentions the year 1952 in a report in one episode. The line was “The Army owes us so many coffee breaks, we should get 1954 off”. A very surreal episode, with the ghost stories and the undead soldier standing out. Having just watched this one, I can confirm he does say 1954. Makes sense since the Korean war ended in 1953, and this being the last season, it should be 1953, despite the timeline of M*A*S*H being so screwy. Agreed on a meh episode. One thing nobody mentioned is that this is another prime example of them having items over there in this unit in Korea that you wouldn’t expect anyone to be able to have. In this case, all the costumes. We’ve seen throughout the series that they can get items delivered, such at the Gorilla suits, and from time to time, various jackets and cold weather gear, but if that’s the case, why are there so many episodes where they are complaining about not having some of the basic essentials? With nothing to spend their money on but booze, you’d think they’d be ordering stuff from places like the SEARS catalog all the time. Sure it would take weeks, maybe even a couple months to get there, but if you ordered stuff all the time, you’d always have stuff coming in. One of the marines was played by George Wendt (“Norm!”) Charles’ reaction was definitely the funniest part of the episode. The undead soldier storyline felt odd, first because it really doesn’t feel like a Halloween type story, and also because nobody actually checks on him. in case anyone’s interested this episode was shown the day before my b’day. The storyline about the not dead dead soldier reminded me of an “Alfred Hitchcock Presents” about a man in an auto accident who is paralyzed and we hear his thoughts as he tries desperately to let the ambulance doctors know he is still alive. Finally someone notices a tear like in this episode. Charles making fun of BJ’s stupid Bullwinkle clown voice was hilarious. He half-heartedly did the face with utter disinterest. Hilarious. Margaret looks great in her skintight dress though I’m not sure what she was trying to be. Young Andrew Dice Clay had a pointless cameo. Didn’t realize it was him until I heard that distinctive voice. Was expecting him to start saying nursery rhymes right there in the compound. Mulcahy saved a life… again but they acted like it was the first time. He half-heartedly tried to act bashful about it but once again his lack of humility and pridefulness won the day.